Here's how you can flaunt smoother and brighter-looking underarms. Giving close attention to our facial and hair needs can be pretty easy, but there's one body part we often neglect that's just as sensitive—our underarms. Our underarms remain to be the private-public part that often dictates what we get to wear or do. Despite being a small part of the body, it can make us feel very conscious. Cleansing your underarms can be as simple as washing it with mild soap during shower time. Just as you remove makeup at the end of the day, you can also give your underarms a regular oil cleanse to remove chemical build-up on the skin. It's as simple as letting oil (sunflower or coconut oil will do) sit for 5-6 minutes and wiping it away with a washcloth—you'd be surprised at the melted residue settling into the area. Wash with mild soap afterward for an extra clean and smooth feel. Our underarms collect dead cells, and the build-up of it on the surface makes our armpits look dark. Exfoliate twice a week using exfoliating cleansers applied on a loofah to prevent darkening and to keep the area smooth. Exfoliation also helps encourage hair to grow out and not get trapped under the skin; otherwise, this results in ugly ingrown hair bumps. Be gentle with exfoliating, though, as to avoid redness or the occurrence of chicken skin since the area can be very sensitive. Sweat is not hydration. As with the rest of your skin, keeping your armpits hydrated will prevent irritation that may result in dark or rough underarms. Especially after exfoliating or shaving, our armpits need to be hydrated—using facial moisturizer or a pat of facial oil can be a quick solution for this. Armpit hair is natural, and whether you remove it or not comes down to personal choice. However, if you do opt to shave, do so in the direction of hair growth. Also, never ever dry shave! Use a shaving cream, a moisturizing body wash, or hair conditioner, and don't shave over the area for more than three times to avoid redness, chicken skin, and skin irritation. Always wait 10 minutes after shaving before you swipe on your antiperspirant. Make sure you're applying enough product to avoid sweat and odor. Don't forget to make use of underarm-friendly products to prevent kili-kili horror stories! Good underarm skincare habits are nothing without a good deo to match them. If you're concerned about finding the right solution to your underarm-related woes, then you need not look further. 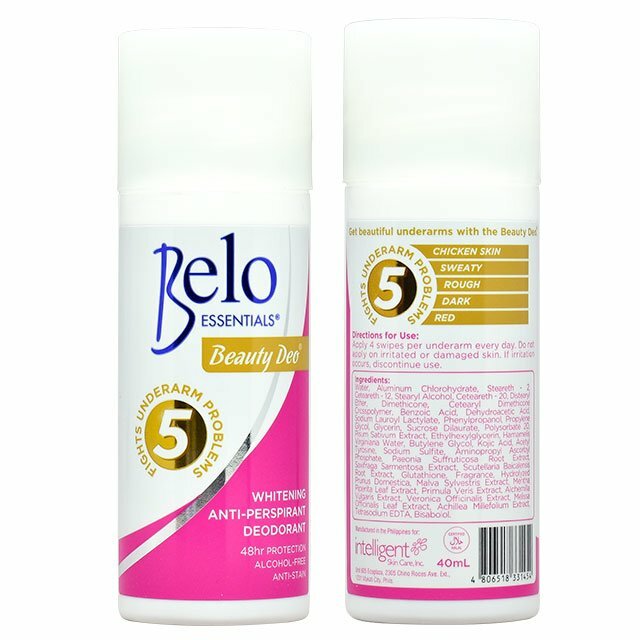 Antiperspirant beauty products such as Belo Beauty Deo not only helps with keeping underarm sweat at bay, it also combats other common underarm problems such as darkness, chicken skin, redness, and roughness—the answer to smoother, kissably beautiful underarms. To purchase the Belo Beauty Deo online, click here. This article was created by Summit Storylabs in partnership with Belo Beauty Deo.